If you haven't discovered this blog, you need to visit it asap. Since most of you reading this are moms (or soon-to-be moms), this blog will encourage you in walking with Jesus as a mother. Click the link. Seriously, click the link. 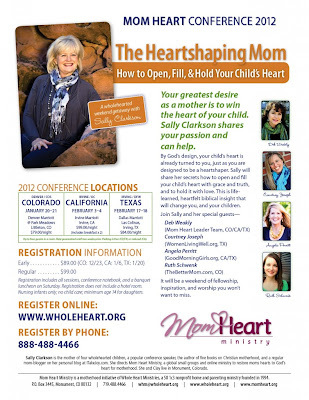 Sally Clarkson is hosting a Mom Heart Conference on February 17-18th in Irving. I'd highly encourage you to attend. Make a weekend of it - meet with God and renew your mothering heart - and you might be surprised how 24 hours away will do you some good. Let me know if you plan on going and we'll see you there!